Located to the south of the equator on Addu Atoll, Shangri La's Villingili Resort & Spa, Maldives is an ultra luxury resort. This is a very unique 5*-star hotel in the Maldives. The lush vegetation, acres of coconut palms and 9 hole golf course sets it apart from every other Maldivian resort. With 143 rooms, 9 different types of accommodation, Shangri La's offers many options, and something for all kinds of travel, where there is plenty to choose from. The most "small" have an area of 133 m2, while the more spacious, unique Villa Laalu, reaches 952 m2! Luxury villas, devoid of any flaws of beauty reign surrounded by tropical gardens or on a golden beach, or over the translucent waters of lagoon and even this is completely new - in the trees! Located in the very South of The Maldives, Addu Atoll extends across the Equator and into the southern hemisphere. The resort is a 70-minute flight from Velana (Malé) Int. Airport and an 8-minute boat transfer from Gan Airport to the resort. Set in the very south of the Maldives, this fabulous and stylish property combines beautiful beaches with both local and British military history. It took a lot of confidence to take on this huge island and turn it into a super luxe resort. Shangri-La has used its experience in the Far East to bring something familiar yet distinctive, grand yet easy-going. 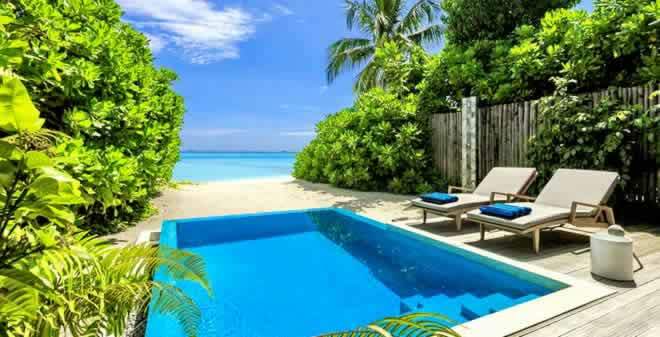 Villingili is 30% bigger than the previous ‘biggest resort island in the Maldives', Soneva Fushi. It's so large that different parts of the island have been given names. Serenity Bay has 2 water villa jetties with 20 villas each, while Whispering Palms has another 20 water villas and a number of beachbeach villas. In between these 2 is The Village. The natural, dense vegetation of the island sets it apart from many other resorts in the Maldives - the island has 12 hectares of lush foliage, towering banyan trees, 17,000 coconut trees, 45 species of plants, three natural lagoons and nature trails for guests to explore. If the names of the first 2 regions don't quite ring true, The Village describes closely what it is. Here are little white roads curving around and between the shops, eco centre, divedive centre, health club, medical centre, tennis courts, childrenchildren's adventure centre, reception and main lounge. And just along the road is the main restaurant, Javvu, facing the sea and adjoining the swimming pool and watersports centre. As befits a luxury resort on a large island, all the rooms are suitably large and well concealed from each other. There are 80 land rooms, 60 over-water rooms and 2 enormous Presidential Suites. Of the beach villas, 20 are twinned for friend or familyfamily use. And this is a good resort for familiesfamilies, with facilities for young children and teenagers. All villas include: 40 inch LCD TV, Bose DVD player, wifi, iPod docking station, open air and indoor showers, oval bathtub, phone, safe, Nespresso machine and minibar. The decor of the rooms is very refined, made for travels in Asia, shorter ... everlasting. Typical furniture from India and the Middle East, fabrics in warm colors and everywhere ... traditional elements do not conflict with design features. Villas that are not on the water provide, between coconut palms, stunning views of the ocean, from the terrace, an open bath or patio area, ideal for dinners under the stars. These brilliant caches for high society (by the way!) offer a fantastic performance and at the same time a pleasant feeling for their owners to no longer touch the ground (literally and figuratively) hovering between the sky and the sea. Close your eyes and imagine yourself standing on a huge terrace overlooking the horizon in shades of blue. Intense! What intoxicates the most satiated luxury travelers? For individual service, each villa is assigned a butler, as it is now fashionable to do in 5-star luxury hotels in Maldives. You come in through an ornate doorway, you are met by your butler and led up the stairs to the deck. Then you exhale a Wow! The pool, sunken in the deck, looks right out to sea. On one side is your lounge, on another side is your bedroom, cloakroom and bathroom. Both richly featured and furnished. And the sound is not that of a distant rumble off the reef or a quiet lap on the shore, but a crunch and gurgle on the rocks below, a sound I've not heard from a resort room before. It is a more immediate sea feel, enjoyed from the raised comfort of your private hideaway. Children are welcome to come and stay at Shangri-La's Villingili Resort. The Cool Zone for children is the place to find toys, educational activities and lots of fun land and beach-based activities. Open from 9am until 7pm for guests aged between 4 and 12 years of age. There is also a babysitting service on offer for those that may require it. Young guests can discover the island's nature and biodiversity with the Island Safari Handbook, which comes complete with a safari map to guide them to the right spots and help them identify the Big 5 and Small 5 inhabitants on land and underwater. Guests of Shangri La's Villingili eat at three exquisite restaurants: Indian, Chinese and Arabic, grouped under the names Dr Ali's, Fashala and Javvu, where breakfast is served in the form of a beautiful and eclectic buffet. You can also have drinks in three bars and lounges with different atmospheres, Endheri, Manzaru and the famous M Lounge. When the occupancy is high enough, a buffet appears at the Javvu restaurant, usually on monday, wednesday and saturday. Dining can be arranged throughout the island: on the beach, while playing golf, in the garden or at your villa. The yacht is also luxurious, and offers the opportunity to go on a cruise with dinner at the equator. There are a range of water-based activities such as wave-surfing, kite surfing, kayaking, windsurfing, sailing or deep-sea fishing. Flat seas and dependable trade winds guarantee ideal conditions for sailing and windsurfing. For diving enthusiasts, there are more than 25 dive sites teeming with marine life. The land based activities include a fully equipped gym and Health Club, an entertainment centre, an Eco Centre, a children's cool zone and two tennis courts. The Shangri-La boasts the only golf course in the Maldives, covering nine holes. There are also five neighbouring islands which are linked together by a 17-kilometre road along which guests can do cycling trips. Mention must be made of Chi, the Spa. 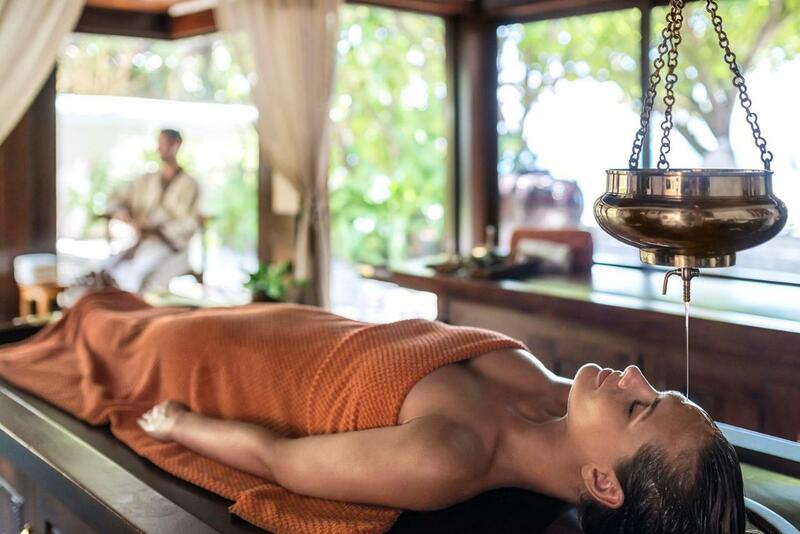 Shangri-La are serious about their spas and you feel this straightaway. Their philosophy is based on the 5 elements of fire, earth, water, wood and metal. A sixth could almost be added here, as the signature treatment is one made up specifically for the Maldives, using the Tiger Cowrie shell and coconut oil. The therapists are carefully selected and highly trained. The atoll is fairly small so the diving is not as extensive as some other areas, but the corals here survived the bleaching event and continue to astound with their beauty and variety. 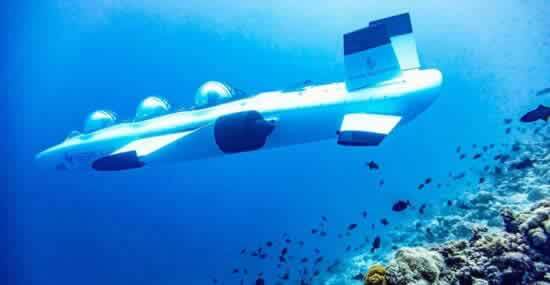 And anywhere with Manta rays year-round and one of the best wreck dives around, has to be counted as world class. Unfortunately there is no access to the house reef from the resort beach, although there is some decent snorkeling to be had in the lagoon. Addu is a special atoll at the southern tip of the Maldives archipelago. It has its own long and proud history, culture and language. Guests here have the rare opportunity to explore neighbouring islands and enrich their own holiday as a result. On one side is Meedhu, which has the oldest cemetery in the Maldives and some people claim it was the first island to convert to Islam. On the other side is the only causeway in the country. 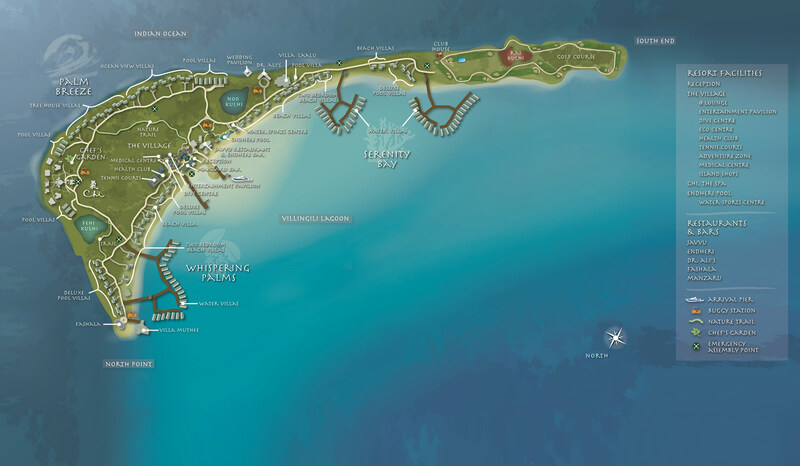 It joins 6 islands together, was built by the British and runs from the international airport of Gan, passed quiet coconut groves and beachesbeaches, up to Hithadu, with the second largest population after Male. The resort offers a variety of ways to discover and enjoy the possibilities. A very beautiful island. Peaceful quite place, with great privacy. the staff are very polite, nice, always smiling and provide the support needed. Snorkelling and scuba diving top of the world. No need to pack your clubs to enjoy Shangri-La's nine-hole golf course with views of the Indian Ocean as an added bonus. The best way to get around the island is by bicycle.